Mesa, also called Mesa3D and The Mesa 3D Graphics Library, is an open source software implementation of OpenGL, Vulkan, and other graphics API specifications. Mesa translates these specifications to vendor-specific graphics hardware drivers. Its most important users are two graphics drivers mostly developed and funded by Intel and AMD for their respective hardware (AMD promotes their Mesa drivers Radeon and RadeonSI over the deprecated AMD Catalyst, and Intel has only supported the Mesa driver). Proprietary graphics drivers (e.g. Nvidia GeForce driver and Catalyst) replace all of Mesa, providing their own implementation of a graphics API. An open-source effort to write a Mesa Nvidia driver called Nouveau is mostly developed by the community. 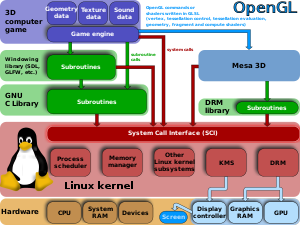 Besides 3D applications such as games, modern display servers (X.org's Glamor or Wayland's Weston) use OpenGL/EGL; therefore all graphics typically go through Mesa. Mesa is hosted by freedesktop.org and was initiated in August 1993 by Brian Paul, who is still active in the project. Mesa was subsequently widely adopted, and now contains numerous contributions from various individuals and corporations worldwide, including from the graphics hardware manufacturers of the Khronos Group that administer the OpenGL specification. For Linux, development has also been partially driven by crowdfunding. Video games outsource rendering calculations to the GPU over OpenGL in real-time. Shaders are written in OpenGL Shading Language or SPIR-V and compiled on the CPU. The compiled programs are executed on the GPU. 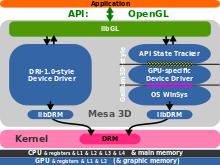 Illustration of the Linux graphics stack: DRM & libDRM, Mesa 3D. Display server belongs to the windowing system and is not necessary e.g. for gaming. The free implementations of Wayland rely upon the Mesa implementation of EGL. The special library called libwayland-EGL, written to accommodate access to the framebuffer, should have been made obsolete by the EGL 1.5 release. On the GDC 2014, AMD was exploring a strategy change towards using DRM instead of their in-kernel blob. Mesa is known as housing implementation of graphic APIs. Historically the main API that Mesa has implemented is OpenGL, along with other Khronos Group related specifications (like OpenVG, OpenGL ES or recently EGL). But Mesa can implement other APIs and indeed it did with Glide (deprecated) and Direct3D 9 (since July 2013.). Mesa is also not specific to Unix-like operating systems: on Windows for example, Mesa provides an OpenGL API over DirectX. Mesa implements a translation layer between a graphics API such as OpenGL and the graphics hardware drivers in the operating system kernel. The supported version of the different graphic APIs depends on the driver, because each hardware driver has its own implementation (and therefore status). This is specially true for the "classic" drivers, while the Gallium3D drivers share common code that tend to homogenize the supported extensions and versions. Mesa maintains a support matrix with the status of the current OpenGL conformance visualized at mesamatrix.net. Mesa 10 complies with OpenGL 3.3, for Intel, AMD/ATI and Nvidia GPU hardware. Mesa 11 was announced with some drivers being OpenGL 4.1 compliant. Mesa 12 contains OpenGL 4.2 and 4.3 and Intel Vulkan 1.0 support. Mesa 13 brought Intel support for OpenGL 4.4 and 4.5 (all Features supported for Intel Gen 8+, Radeon GCN, Nvidia (Fermi, Kepler), but no Khronos-Test for 4.5-Label) and experimental AMD Vulkan 1.0 support through the community driver RADV. OpenGL ES 3.2 is possible with Intel Skylake (Gen9). 1st stable version of 2017 is 17.0 (new year Counting). Ready features are certified OpenGL 4.5, OpenGL 4.5 for Intel Haswell, OpenGL 4.3 for NVidia Maxwell and Pascal (GM107+). Huge performance gain was measured with Maxwell 1 (GeForce GTX 750 Ti and more with GM1xx). Maxwell-2-Cards (GeForce GTX 980 and more with GM2xx) are underclocked without NVidia information. The Khronos CTS test suite for OpenGL 4.4, 4.5 and OpenGL ES 3.0+ is in now (2017-01-24) Open Source and all tests for Mesa 13 and 17 are now possible without costs. 2nd stable version of 2017, 17.1.0, came out on 10 May 2017 with some interesting improvements. OpenGL 4.2+ for Intel Ivy Bridge and OpenGL 3.3+ for Intel Open SWR Rasterizer are 2 of the highlights. Note that due to the modularized nature of OpenGL, Mesa can actually support extensions from newer versions of OpenGL without claiming full support for such versions. For example, in July 2016, Mesa supported OpenGL ES 3.1 but also all OpenGL ES 3.2 extensions except for five, as well as a number of extensions not part of any OpenGL or OpenGL ES version. An open question for Mesa and Linux is High Dynamic Range (HDR). Many problems and open points are in pipe for a clean and basic implementation. 4th Version 17.3 is ready since December 2017. Many improvements in many drivers are available. OpenGL 4.6 is nearly fully available (Spir-V is not ready). AMD Vulkan Driver RADV is now fully conformant in Khronos-Test. 1st version of 2018 is 18.0 and available since March 2018 by same scheme in 2017. Full OpenGL 4.6 support is not ready, but many features and improvements were successfully tested in RC3. 10-bit support for Intel i965 in Colors is also a Highlight. New is support for Intel Cannon Lake and AMD Vega with actual Linux Version. AMD Evergreen Chips (RV800 or R900) are near OpenGL 4.5 support. Old AMD R600 or RV700 Chips can only support OpenGL 3.3 with some features of OpenGL 4.x. Freedreno is the Driver for Adreno Hardware and near OpenGL 3.3 support. 2nd version of 2018 is 18.1 and available since May. Target is Vulkan 1.1.72 in Intel ANV and AMD RADV driver. OpenGL 4.6 with spir-V is also main target. Permanent work is possible completion of Features and Optimization of drivers for older hardware like AMD R600/Evergreen, Nvidia Tesla and before, Fermi, Kepler or Intel Sandybridge, Ivybridge, Haswell or Broadwell. ARM Architecture made also great improvements in Adreno 3xx/4xx/5xx and Broadwell VC4/VC5 for Raspi with main target OpenGL ES. 4th version of 2018 is 18.3 and released as stable Version 18.3.1 in December 2018. Many features in Detail and support of newer hardware are main parts. Full support of OpenGL 4.6 is not ready. 2nd Version of 2019 is 19.1. Transition of TGSI to NIR is here one main Feature on way to OpenGL 4.6 with Spir-V and more OpenCL. RadeonSI runs well in dev-Version with NIR. The Khronos Group officially announced Vulkan API in March 2015, and officially released Vulkan 1.0 on February 16, 2016. Vulkan breaks compatibility with OpenGL and completely abandons its monolithic state machine concept. The developers of Gallium3D called Vulkan to be something along the lines of Gallium3D 2.0 – Gallium3D separates the code that implements the OpenGL state machine from the code that is specific to the hardware. As Gallium3D ingests TGSI, Vulkan ingests SPIR-V (Standard Portable Intermediate Representation version "V" as in "Vulkan"). Intel released their implementation of a Vulkan driver for their hardware the day the specification was officially released, but it was only mainlined in April and so became part of Mesa 12.0, released in July 2016. While already the i965 driver wasn't written according to the Gallium3D specifications, for the Vulkan driver it makes even less sense to flange it on top of Gallium3D. Similarly there is no technical reason to flange it with NIR, but yet Intel's employees implemented their Vulkan driver that way. It is to be expected that AMD's own proprietary Vulkan driver, which was released in March, and was announced to be released as free and open-source software in the future and be mainlined into Mesa, also abandons Gallium3D. RADV is a free project for AMD and is available since version 13. Conformance with Khronos-Test came in version 17.3. Actual is Full support of Vulkan 1.0 and 1.1 since Mesa 18.1. Nvidia released their proprietary GeForce driver with Vulkan support at launch day and Imagination Technologies (PowerVR), Qualcomm (Adreno) and ARM (Mali) have done the same or at least announced proprietary Vulkan drivers for Android and other operating systems. But when and whether additional free and open-source Vulkan implementations for these GPUs will show up, remains to be seen. A kind of memory barrier which separates one buffer from the rest of the memory is called a fence. Fences are there to ensure that a buffer is not being overwritten before rendering and display operations have completed on it. Implicit fencing is used for synchronization between graphics drivers and the GPU hardware. The fence signals when a buffer is no longer being used by one component so it can be operated on or reused by another. In the past the Linux kernel had an implicit fencing mechanism, where a fence is directly attached to a buffer (cf. GEM handles and FDs), but userspace is unaware of this. Explicit fencing exposes fences to userspace, where userspace gets fences from both the Direct Rendering Manager (DRM) subsystem and from the GPU. Explicit fencing is required by Vulkan and offers advantages for tracing and debugging. Linux kernel 4.9 added Android's synchronization framework to mainline. Generic Buffer Management (GBM) is an API which provides a mechanism for allocating buffers for graphics rendering tied to Mesa. GBM is intended to be used as a native platform for EGL on drm or openwfd. The handle it creates can be used to initialize EGL and to create render target buffers. Mesa GBM is an abstraction of the graphics driver specific buffer management APIs (for instance the various libdrm_* libraries), implemented internally by calling into the Mesa GPU drivers. For example, the Wayland compositor Weston does its rendering using OpenGL ES 2, which it initializes by calling EGL. Since the server runs on the "bare KMS driver", it uses the EGL DRM platform, which could really be called as the GBM platform, since it relies on the Mesa GBM interface. At XDC2014, Nvidia employee Andy Ritger proposed to enhance EGL in order to replace GBM. For example, Nouveau, which has been developed as part of Mesa, but also includes a Linux kernel component, which is being developed as part of the Linux kernel, supports the PureVideo-branded ASICs and provides access to them through VDPAU and partly through XvMC. The free radeon driver supports Unified Video Decoder and Video Coding Engine through VDPAU and OpenMAX. Please note, that V4L2 is a kernel-to-user-space interface for video bit streams delivered by webcams or TV tuners. Graphics device drivers are implemented using two components: a UMD (user-mode driver) and a KMD (kernel-mode driver). Starting with Linux kernel 4.2 AMD Catalyst and Mesa will share the same Linux kernel driver: amdgpu. Amdgpu provides interfaces defined by DRM and KMS. The available free and open-source device drivers for graphic chipsets are "stewarded" by Mesa (because the existing free and open-source implementation of APIs are developed inside of Mesa). Currently there are two frameworks to write graphics drivers: "classic" and Gallium3D. An overview over some (but not all) of the drivers available in Mesa is given at mesamatrix.net. There are device drivers for AMD/ATI R100 to R800, Intel, and Nvidia cards with 3D acceleration. Previously drivers existed for the IBM/Toshiba/Sony Cell APU of the PlayStation 3, S3 Virge & Savage chipsets, VIA chipsets, Matrox G200 & G400, and more. The free and open-source drivers compete with proprietary closed-source drivers. Depending on the availability of hardware documentation and man-power, the free and open-source driver lag behind more or less in supporting 3D acceleration of new hardware. Also, 3D rendering performance was usually significantly slower with some notable exceptions. Today this is still true for Nouveau for most NVIDIA GPUs while on AMDs Radeon GPUs the open driver now mostly matches or exceeds the proprietary driver's performance. At the time 3D graphics cards became more mainstream for PCs, individuals partly supported by some companies began working on adding more support for hardware-accelerated 3D rendering to Mesa.[when?] The Direct Rendering Infrastructure (DRI) was one of these approaches to interface Mesa, OpenGL and other 3D rendering API libraries with the device drivers and hardware. After reaching a basic level of usability, DRI support was officially added to Mesa. This significantly broadened the available range of hardware support achievable when using the Mesa library. With adapting to DRI, the Mesa library finally took over the role of the front end component of a full scale OpenGL framework with varying backend components that could offer different degrees of 3D hardware support while not dropping the full software rendering capability. The total system used many different software components. While the design requires all these components to interact carefully, the interfaces between them are relatively fixed. Nonetheless, as most components interacting with the Mesa stack are open source, experimental work is often done through altering several components at once as well as the interfaces between them. If such experiments prove successful, they can be incorporated into the next major or minor release. That applies e.g. to the update of the DRI specification developed in the 2007-2008 timeframe. The result of this experimentation, DRI2, operates without locks and with improved back buffer support. For this, a special git branch of Mesa was created. DRI3 is supported by the Intel driver since 2013 and is default in some Linux distributions since 2016 to enable Vulkan support and more. It is also default on AMD hardware since late 2016 (X.Org Server 1.18.3 and newer). Mesa also contains an implementation of software rendering that allows shaders to run on the CPU as a fallback when no graphics hardware accelerators are present called swrast. The Gallium software rasterizer is known as softpipe or when built with support for LLVM llvmpipe which generates CPU code at runtime. Since Mesa 10.x OpenGL 3.3+ is supported for Softpipe (10.3) and LLVMpipe (10.2). Actual about 80% of Features from OpenGL 4.x are implemented in Mesa 17.3 (See Mesamatrix). In Mesa 12.0 a new Intel Rasterizer OpenSWR is available with high advantages in clusters for large data sets. It's more focused on engineering visualisation than in game or art imagery and can only work on x86 processors. On the other hand, OpenGL 3.1+ is now supported. Acceleration values from 29 to 51 related to LLVMPIPE were measured in some examples. Only change to option "GALLIUM_DRIVER="swr" is necessary. OpenGL 3.3+ is supported for OpenSWR since Mesa 17.1. VirGL is a Rasterizer for Virtual machines implemented in Mesa 11.1 since 2015 with OpenGL 3.3 support and showed in Mesamatrix since Mesa 18. In actual new Mesa 18.2 it supports more than the others with OpenGL 4.3 and OpenGL ES 3.2. About 80% of OpenGL 4.4 and 4.5 features are also now ready. Vulkan Development starts with GSOC 2018 projects. The idea of bundling multiple drivers into a single "mega" driver was proposed by Eric Anholt. It allows for a single copy of the shared Mesa code to be used among multiple drivers (instead of it existing in each driver separately) and offering better performance than a separate shared library due to the removal of the internal library interface. The state trackers for VDPAU and XvMC have become separate libraries. shader-db is a collection of about 20,000 shaders gathered from various computer games and benchmarks as well as some scripts to compile these and collect some statistics. Shader-db is intended to help validate an optimization. It was noticed that an unexpected number of shaders are not hand-written but generated. This means these shaders were originally written in HLSL and then translated into GLSL by some translator program, such as e.g. HLSL2GLSL. The problem is, that the generated code is often far from being optimal. Matt Turner said it was much easier to fix this in the translator program than having to make Mesa's compiler carry the burden of dealing with such bloated shaders. shader-db cannot be considered free and open-source software. To use it legally, one must have a license for all the computer games, that the shaders are part of. At least the Valve Corporation has granted all Mesa and all Debian developers free personal licenses for all the games distributed on Steam. A graphics driver consists of an implementation of the OpenGL state machine and a compilation stack to compile the shaders into the GPU's machine language. This compilation, as well as pretty much anything else, is executed on the CPU, then the compiled shaders are sent to the GPU and are executed by it. (SDL = Simple DirectMedia Layer). The Intermediate Representations (IRs) in Mesa: GLSL IR, Mesa IR, TGSI, and LLVM IR. Missing are HIR, LIR and NIR. Mesa IR is due to be removed completely. One goal of Mesa is the optimization of code that is to be executed by the respective GPU. Another is the sharing of code. Instead of documenting the pieces of software, that do this or that, this Wikipedia article shall instead look at the Intermediate Representations used in the process of compiling and optimizing. See Abstract syntax tree (AST) and Static single assignment form (SSA form). SPIR-V is a certain version of the Standard Portable Intermediate Representation. The idea is, that graphics applications output SPIR-V instead of GLSL. In contrast to the latter, SPIR-V is binary to avoid implementation differences between GLSL compiler frontends of different driver implementations, as this has been a major source of application incompatiblities and bugs. Also SPIR-V binary usually also passed through some general optimizations. Also to some degree, SPIR-V's binary representation offers some degree of obfuscation, which might appeal to some software vendors as a form of intellectual property protection; however it should be noted, that SPIR-V contains ample information for reflection and tools exist that translate SPIR-V back into high quality, human readable high level code. A UMD needs only apply optimizations, that are specific to the supported hardware. NIR will be extended in next releases as base of Spir-V support. RadeonSI and Noveau will change next to NIR from TGSI. The Tungsten Graphics Shader Infrastructure (TGSI) was introduced in 2008 by Tungsten Graphics. All Gallium3D-style UMDs ingest TGSI. The UMDs radeonsi and llvmpipe do not output machine code, but instead LLVM IR. From here on, LLVM does optimizations and the compilation to machine code. This does mean, that a certain minimum version of LLVM has to be installed as well. Mesa's GLSL compiler generates its own IR. Because each driver has very different requirements from a LIR, it differentiates between HIR (high-level IR) and LIR (low-level IR). Gallium3D is a set of interfaces and a collection of supporting libraries intended to ease the programming of device drivers for 3D graphics chipsets for multiple operating systems, rendering or video acceleration APIs. A feature matrix is being provided at GalliumStatus, and the efforts of writing free and open-source device drivers for graphics chips is being separately documented in the Wikipedia: Free and open-source graphics device driver. The development of Gallium3D started in 2008 at Tungsten Graphics, and the implementation is available as free and open-source software as part of Mesa 3D hosted by freedesktop.org. The primary goal of making driver development easier, bundling otherwise duplicated code of several different drivers at a single point, and to support modern hardware architectures. This is done by providing a better division of labor, for example, leaving memory management to the kernel DRI driver. Gallium3D has been a part of Mesa since 2009 and is currently used by the free and open-source graphics driver for Nvidia (nouveau project), for R300–R900, and for other free and open-source GPU device drivers. Each graphical API by which a device driver is being addressed has its own State Tracker, e.g. there is a Gallium3D State Tracker for OpenGL and a different one for Direct3D or GLX. Each State Tracker contains an implementation of the Gallium3D State Tracker Interface, and is unique, this means is shared by all existent Gallium3D device drivers. This is the actual code, that is specific to the underlying 3D graphic accelerator, but only as far as the Gallium3D WinSys Interface allows. 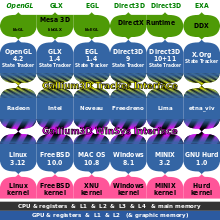 There is a unique Gallium3D hardware device driver for each available graphics chip and each implements the Gallium3D State Tracker Interface as well as the Gallium3D WinSys Interface. The Gallium3D hardware device driver understands only TGSI (Tungsten Graphics Shader Infrastructure), an intermediate language for describing shaders. This code translated shaders translated from GLSL into TGSI further into instruction set implemented by the GPU. This is specific to the underlying kernel of the operating system and each one implements the Gallium3D WinSys Interface to interface with all available Gallium3D hardware device drivers. VC4 and freedreno can both consume NIR directly (and fall back to tgsi_to_nir for shaders which do not use glsl_to_nir). A possible example matrix when implementing the Gallium3D driver model. Through the introduction of the Gallium3D Tracker Interface and the Gallium3D WinSys Interface, only 18 instead of 36 modules are required. Each WinSys module can work with each Gallium3D device driver module and with each State Tracker module. Gallium3D provides a unified API exposing standard hardware functions, such as shader units found on modern hardware. Thus, 3D APIs such as OpenGL 1.x/2.x, OpenGL 3.x, OpenVG, GPGPU infrastructure or even Direct3D (as found in the Wine compatibility layer) will need only a single back-end, called a state tracker, targeting the Gallium3D API. By contrast, classic-style DRI device drivers require a different back-end for each hardware platform and several other APIs need translation to OpenGL at the expense of code duplication. All vendor device drivers, due to their proprietary and closed-source nature, are written that way meaning that, e.g. the AMD Catalyst implements both OpenGL and Direct3D, and the vendor drivers for the GeForce have their implementations. Under Gallium3D, Direct Rendering Manager (DRM) kernel drivers will manage the memory and Direct Rendering Interface (DRI2) drivers will be more GPU processing oriented. During the transition period from userspace modesetting to kernelspace modesetting some of the Mesa 3D drivers, such as the radeon driver or Intel's drivers, ended up supporting both DRI1 and DRI2 and used DRI2 if available on the system. Gallium3D additionally requires a level of shader support that is not available on older cards like e.g. ATi r100-r200 so users for those cards need to keep using Mesa 3D with DRI2 for their 3D usage. Tungsten Graphics Shader Infrastructure (TGSI) is an Intermediate representation like LLVM Intermediate Representation or the new Standard Portable Intermediate Representation (SPIR) to be used by the Vulkan API and OpenCL 2.1. Shaders written in OpenGL Shading Language are to be translated/compiled into TGSI, then optimizations are made, and then the TGSI shaders are being compiled into shaders for the instruction set of the used GPU. GlassyMesa is an LLVM-based compiler stack for shaders written in GLSL. For SSA see the article Static single assignment form. In addition, using the modular structure of Gallium3D, there is an effort underway to use the LLVM compiler suite and create a module to optimize shader code on the fly. The library represents each shader program using an extensible binary intermediate representation called Tungsten Graphics Shader Infrastructure (TGSI) which LLVM then translates into GLSL shaders optimized for target hardware. Several free and open-source graphics device drivers, which have been, or are being written based on information gained through clean-room reverse engineering, adopted the driver model provided by Gallium3D, e.g. nouveau and others (see Free and open-source graphics device driver for a complete list). The main reason may be that the Gallium3D driver model lessens the amount of code required to be written. [original research?] Of course, being licensed under a free software license, this code can at any time by anybody be rewritten to implement the DRI-, or some other, driver model. Original authors of Gallium3D were Keith Whitwell and Brian Paul at Tungsten Graphics (acquired by VMware in 2008. As of fall 2011, there were at least 10 known, mature and working Gallium3D drivers. [not in citation given] Open-source drivers for Nvidia graphics cards by the name of Nouveau team develops its drivers using the Gallium3D framework. 2008-07-13: Nouveau development is done exclusively for the Gallium framework. The old DRI driver was removed from the master branch of the Mesa repository on Freedesktop.org. 2009-02-11: The gallium-0.2 branch was merged into mainline Master branch of Mesa. Development is done in Mesa mainline. 2009-02-25: Gallium3D can run on Linux as well as FreeBSD kernels. 2009-05-01: Zack Rusin from Tungsten Graphics added the OpenVG state tracker to Mesa 3D, which enables Scalable Vector Graphics to be hardware-accelerated by any Gallium3D-based driver. 2009-07-17: Mesa3D 7.5 is released, the first version to include Gallium3D. 2010-09-10: Initial support for the Evergreen GPUs was added to the r600g driver. 2010-09-21: There are two Gallium3D drivers for ATI hardware known as r300g and r600g for R300-R500 and R600-Evergreen GPUs respectively. 2010-09-21: Major commits were made to the code to support Direct3D 10 and 11. In time, this might offer the ability to use recent Direct3D implementations on GNU/Linux systems. 2011-11-30: Intel 965g and Cell Gallium drivers were removed from the master branch of Mesa as unmaintained and broken. 2014-11-18: Major commits were made to the code to support Direct3D 9. Project initiator Brian Paul was a graphics hobbyist. He thought it would be fun to implement a simple 3D graphics library using the OpenGL API, which he might then use instead of VOGL (very ordinary GL Like Library). Beginning in 1993, he spent eighteen months of part-time development before he released the software on the Internet. The software was well received, and people began contributing to its development. Mesa started off by rendering all 3D computer graphics on the CPU. Despite this, the internal architecture of Mesa was designed to be open for attaching to graphics processor-accelerated 3D rendering. In this first phase, rendering was done indirectly in the display server, leaving some overhead and noticeable speed lagging behind the theoretical maximum. The Diamond Monster 3D, using the Voodoo Graphics chipset, was one of the first 3D hardware devices supported by Mesa. The first true graphics hardware support was added to Mesa in 1997, based upon the Glide API for the then new 3dfx Voodoo I/II graphics cards and their successors. A major problem of using Glide as the acceleration layer was the habit of Glide to run full screen, which was only suitable for computer games. Further, Glide took the lock of the screen memory, and thus the display server was blocked from doing any other GUI tasks. ^ Marshall, David (2008-12-16). "VMware's year end acquisition of Tungsten Graphics". InfoWorld. Retrieved 2011-08-06. ^ a b "Mesa Introduction". Mesa Team. Retrieved 2015-06-08. ^ a b "Mesa 19.0.2 Release Notes". mesa3d.org. 11 April 2019. Retrieved 11 April 2019. ^ "[Mesa-announce] mesa". 6 March 2019. Retrieved 2019-04-12. ^ "Mesa Languages Page". Open Hub. Retrieved 2015-03-02. ^ "Mesa 3D license". Retrieved 2015-06-03. ^ "Improve OpenGL support for the Linux Graphics Drivers - Mesa". Indiegogo. 2013-12-11. Retrieved 2015-01-21. ^ "AMD exploring new Linux driver Strategy". 2014-03-22. Retrieved 2014-03-23. ^ "Direct3D 9 Support Released For Linux Via Gallium3D, Running Games - Phoronix". Phoronix.com. Retrieved 1 August 2018. ^ "mesa/mesa - The Mesa 3D Graphics Library". Retrieved 2016-11-02. ^ "The OpenGL vs Mesa matrix". 2015-03-25. Retrieved 2015-03-29. ^ "Mesa 11.0 Has Been Branched, The Release March Begins". 2015-08-22. Retrieved 2015-08-22. ^ a b "Mesa 17.0.0 Officially Released". Phoronix. 2017-02-13. Retrieved 2017-02-13. ^ "mesa/mesa - The Mesa 3D Graphics Library". Cgit.freedesktop.org. Retrieved 1 August 2018. ^ "The Big Changes, Improvements Of Mesa 17.0 - Phoronix". Phoronix.com. Retrieved 1 August 2018. ^ "Program" (PDF). www.x.org. 2016. ^ "A Look At The Huge Performance Boosts With Nouveau Mesa 17.0-devel On Maxwell - Phoronix". Phoronix.com. Retrieved 1 August 2018. ^ "Khronos Open-Sources OpenGL / OpenGL ES Conformance Tests - Phoronix". Phoronix.com. Retrieved 1 August 2018. ^ "The Grand Features Of Mesa 17.1: Vega, RadeonSI Shader Cache, Maturing Vulkan, New OpenGL Extensions - Phoronix". Phoronix.com. Retrieved 1 August 2018. ^ "Mesa Release Notes". Mesa3d.org. Retrieved 1 August 2018. ^ "The OpenGL vs Mesa matrix". mesamatrix.net. Retrieved 2016-07-31. ^ "Title" (PDF). Retrieved 2018-08-01. ^ "Event listing" (PDF). www.x.org. ^ "Mesa 17.3 Features - Vulkan Updates, Better Performance - Phoronix". Phoronix.com. Retrieved 1 August 2018. ^ a b c d e "Release calendar". Mesa3d.org. Retrieved 1 August 2018. ^ "Mesa 18.0 Features Include Many OpenGL/Vulkan Improvements, Intel Shader Cache & Extras - Phoronix". Phoronix.com. Retrieved 1 August 2018. ^ a b "Mesa 18.2 Is Releasing Soon With Many OpenGL / Vulkan Driver Improvements - Phoronix". www.phoronix.com. ^ "The Shiny New Features Of Mesa 18.3 For Open-Source Intel / Radeon Graphics Drivers - Phoronix". www.phoronix.com. ^ "Mesa Made Massive Progress In 2018 On Open-Source Vulkan / OpenGL Drivers - Phoronix". www.phoronix.com. ^ Larabel, Michael (4 March 2015). "OpenVG Support Stripped From Gallium3D". Phoronix. Retrieved 11 July 2015. ^ "latest patches to "nine" state tracker". Cgit.freedesktop.org. 2016-02-04. ^ Larabel, Michael (14 December 2014). "Mesa 10.4 Officially Released With Direct3D 9 State Tracker". Phoronix. Retrieved 11 July 2015. ^ a b c d e f g "Index of /archive". mesa.freedesktop.org. Retrieved 24 January 2019. ^ "Mesa Release Notes". www.mesa3d.org. Retrieved 24 January 2019. ^ "Mesa Release Notes". mesa3d.org. Retrieved 24 January 2019. ^ "Mesa 18.0 Should Arrive Today With Many Vulkan/OpenGL Driver Improvements - Phoronix". Phoronix.com. Retrieved 1 August 2018. ^ "GalliumCompute". Dri.freedesktop.org. Retrieved 24 January 2019. ^ "[Mesa-announce] mesa 17.0.0". Retrieved 2017-02-13. ^ "[Mesa-announce] mesa 13.0.0". Retrieved 2016-11-02. ^ a b "Mesa 12.0 Released With OpenGL 4.3 Support, Intel Vulkan & Many Other Features". 2016-07-08. Retrieved 2016-07-08. ^ "[Mesa-announce] Mesa 11.2.0". Retrieved 2016-04-04. ^ "[Mesa-announce] Mesa 11.1.0". Retrieved 2015-12-15. ^ "[Mesa-announce] Mesa 11.0.0". Retrieved 2015-09-26. ^ "[Mesa-announce] Mesa 10.6.0". Retrieved 2015-06-15. ^ Larabel, Michael (2013-10-26). "Features To Be Found In Mesa 10.0". Phoronix. ^ "[Mesa-announce] Mesa 10.5.0". Retrieved 2015-03-07. ^ "[Mesa-announce] Mesa 10.4.0 released". Retrieved 2015-03-07. ^ "[Mesa-announce] Mesa 10.3 released". Retrieved 2015-03-07. ^ "[Mesa-announce] Mesa 10.2 released". Retrieved 2015-03-07. ^ "[Mesa-announce] Mesa 10.1 released". Retrieved 2015-03-07. ^ "[Mesa-announce] Mesa 10.0 released". Retrieved 2015-03-07. ^ "Mesa 9.0 Release Notes". Mesa. 8 October 2012. Retrieved 11 July 2015. ^ "Radeon Vulkan Driver Added To Mesa, Fresh Radeon Vulkan vs. OpenGL Benchmarks + AMDGPU-PRO - Phoronix". Phoronix.com. Retrieved 1 August 2018. ^ a b "Vulkan Virgl Has Kicked Off For Supporting This Graphics/Compute API Within VMs - Phoronix". www.phoronix.com. ^ "Bringing Android explicit fencing to the mainline". LWN.net. 2016-10-05. ^ "libgbm in the Debian repositories". Packages.debian.org. ^ "Enabling Alternative Window Systems with a non-Mesa Graphics Driver Implementation". X.org. ^ "Nouveau Video Acceleration". freedesktop.org. ^ "Radeon Feature Matrix". freedesktop.org. ^ Toral, Iago (8 August 2014). "Diving into Mesa". Retrieved 19 May 2016. ^ "Direct Rendering Infrastructure Status Page". freedesktop.org. ^ "How to improve gaming performance on your Linux machine - APC". Apcmag.com. 25 July 2013. Retrieved 1 August 2018. ^ "Linux: Mesa, Gallium3D, Nouveau and NVIDIA Drivers, OpenGL Test (GTX 280, GTX 480, GTX 580) – Geeks3D". Geeks3d.com. Retrieved 1 August 2018. ^ "Nouveau Driver Remains Much Slower Than NVIDIA's Official Driver - Phoronix". Phoronix.com. Retrieved 1 August 2018. ^ "Intel/NVIDIA/AMD Compete On Open/Closed Source Linux GPU Driver Performance - Phoronix". Phoronix.com. Retrieved 1 August 2018. ^ a b c Paul, Brian (2000-08-10). "Introduction to the Direct Rendering Infrastructure". Dri.sourceforge.net. Retrieved 2012-01-25. ^ "DRI2". X.org. Archived from the original on 16 April 2013. Retrieved 25 January 2012. ^ "DRI3 and Present [LWN.net]". lwn.net. Retrieved 1 August 2018. ^ "[PATCH 0/6] Add DRI3000 support to core and i965 drivers". Lists.freedesktop.org. Retrieved 2018-08-01. ^ "xorg-x11-drv-intel-2.99.917-19.20151206.fc23 (re)enabled dri3 by default - kde - Fedora Mailing-Lists". lists.fedoraproject.org. Retrieved 2016-12-03. ^ "Radeon-AMDGPU-1.19-Updates". Google.de. Retrieved 2016-12-03. ^ "LLVMpipe: OpenGL With Gallium3D on Your CPU". Phoronix.com. 2010-04-30. Retrieved 2014-11-04. ^ "llvmpipe". mesa3d.org. Retrieved 2015-06-08. ^ "OpenSWR". openswr.org. Retrieved 1 August 2018. ^ "Mesamatrix: The OpenGL vs Mesa matrix". mesamatrix.net. Retrieved 1 August 2018. ^ "Tracking Mesa's VirGL OpenGL Features - Phoronix". www.phoronix.com. ^ "Mesa's VirGL Now Has OpenGL 4.2 Support To Offer Guest VMs - Phoronix". www.phoronix.com. ^ "The Current Performance Of Virgl3D, Future Plans - Phoronix". www.phoronix.com. ^ "DRI megadrivers". X.org. 2013-09-25. ^ "VDPAU & XvMC state trackers are now separate libraries". Phoronix.com. 2014-06-23. ^ "Build configuration file". cgit.freedesktop.org. Gallium documentation. ^ Fonseca, José (2008-04-27). "Gallium3D: Introduction". Retrieved 2014-06-20. ^ Fonseca, José. "MESA3D.org: Introduction". Retrieved 2016-10-28. ^ "Gallium3D Now In Mainline Mesa Code-Base!". Phoronix. 2009-02-11. Retrieved 2010-10-26. ^ "The state of Nouveau, part 2". LWN.net. 2008-02-26. Retrieved 2008-03-07. ^ a b "Nouveau Companion 36". Nouveau.freedesktop.org. 7 March 2008. Archived from the original on 7 March 2013. Retrieved 1 April 2008. ^ "ATI R300 Gallium3D DRI Support Is "Done"". Phoronix. 2009-11-09. Retrieved 2010-11-15. ^ "Radeon "R600g" Gallium3D Driver Merged To [Mesa] Master". Phoronix. 2010-05-27. Retrieved 2010-10-26. ^ "X.Org Wiki GalliumStatus". Xorg. 2010-09-22. Retrieved 2010-12-07. ^ "TG-Gallium3D". Tungsten Graphics. Archived from the original on 2008-05-03. Retrieved 2008-04-01. ^ Rusin, Zack (2008-02-06). "GPGPU". Retrieved 2008-04-01. ^ Rusin, Zack (2008-02-07). "OpenVG and accelerating 2D". Retrieved 2008-04-01. ^ "DRI2". 4 October 2007. Archived from the original on 4 July 2008. Retrieved 1 April 2008. ^ Rusin, Zack (2007-11-02). "Gallium3D LLVM". Retrieved 2008-04-01. ^ Marshall, David (2008-12-16). "VMware's year end acquisition of Tungsten Graphics". InfoWorld. ^ "Gallium". Freedesktop.org. 2011-11-02. Retrieved 2012-08-24. ^ "Nouveau Companion 37". Nouveau.freedesktop.org. 21 March 2008. Archived from the original on 8 February 2012. Retrieved 1 April 2008. ^ "nouveau: say goodbye to the old DRI driver... (cgit on FDO)". Cgit.freedesktop.org. 2008-07-13. ^ "Gallium3D Now In Mainline Mesa Code-Base!". Phoronix.com. 2009-02-11. ^ Larabel, Michael (2009-02-25). "Gallium3D, EGL Now Buildable On FreeBSD". Phoronix. ^ "OpenVG state tracker is in Mesa 3D". Sourceforge.net. 2009-05-01. ^ "Mesa 7.5 Release Notes / 17 July 2009". Mesa3d.org. 17 July 2009. Archived from the original on 13 June 2010. Retrieved 12 September 2017. ^ "r600g: add initial evergreen support (cgit on FDO)". Cgit.freedesktop.org. 2010-09-10. ^ "d3d1x: add new Direct3D 10/11 COM state tracker for Gallium". Cgit.freedesktop.org. 2010-09-21. ^ Larabel, Michael (2011-11-30). "The Gallium3D Intel 965 Driver Gets Dropped". Phoronix. p. 1. Retrieved 2011-12-01. ^ Larabel, Michael (2011-11-30). "The Gallium3D Cell Driver Gets Dropped Too". Phoronix. p. 1. Retrieved 2011-12-01. ^ "nine: Add state tracker nine for Direct3D9 (v3)". Cgit.freedesktop.org. 2014-11-18. ^ "What's the relationship between Glide and DRI?". dri.freedesktop.org. Retrieved 2012-01-25. Edge, Jake (October 2013). "The history of Mesa".